The British Columbia Native Plant Garden lies on the centre island of the parking lot adjacent to the Cary Castle Mews. This garden features plants of British Columbia from the University of British Columbia Botanical Garden. The planting of this garden was a project by the horticultural class of Camosun College in Victoria. The Cut Flower Garden is dominated by a magnificent London plane tree which provides shade for hostas, hellebores, primulas and other shade-loving plants. Sunny areas are planted with herbaceous perennials and foliage plants including hardy geraniums, Crambe cordifolia, artemisia “Powis Castle” and South African phygelius species. Rocky areas are home to euphorbia species and potentilla, “Abbotswood Silver”. This small orchard on the east side of the property is dedicated to the late Mrs. Dorothy Lam, former chatelaine of Government House (1988-1994). The orchard includes apples, plum and quince trees and each year the fruit is used by the Government House Kitchen wherever possible. The Duck Pond, located at the front of the property, is surrounded by bamboo and features a laburnum tree. Groups of Iris pseudacorus and Acorus calamus are planted in the water and the pond is home to a variety of ducks, turtles and many forms of birdlife. The English Country Garden is located just inside the main entry gate of the Government House grounds. Like the garden of an English country house, it is intended to be a splendid show of flowers for the summer months. In spring there is a colourful display of flowering bulbs including primulas, pulmonarias and hellebores. Many traditional cottage garden plants are also featured, including campanulas, forget-me-nots and foxgloves. Herbaceous perennials, flowering shrubs and trees provide interest year round. The Herb Garden lies adjacent to the Sunken Rose Garden, on the west side of Government House. Many of the herbs are grown for use in the Government House Kitchen. A medlar tree and a quince tree, popular in traditional herb gardens, are also found. The centrepiece of the Herb Garden is a sundial supported by a carving of an orca, created by Salish carver Aubrey La Fortune. 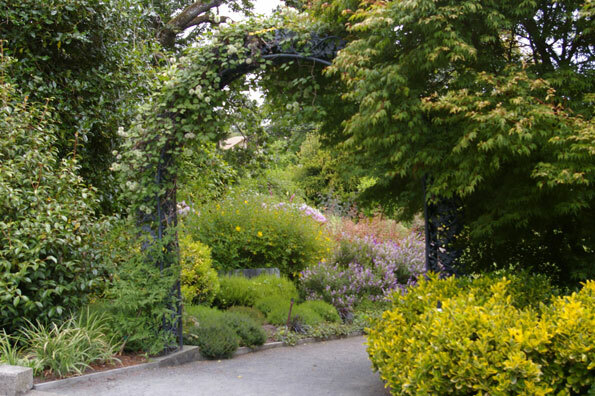 Andrew Yeoman of Ravenhill Herb Farms designed the garden, donated plants and advised the Friends of Government House Gardens Society on maintenance. The Iris Garden is located on the east side of the property, along the path to the Nursery Garden. Two iris borders line the path, one of blue and white iris, and one featuring iris provided by the BC Iris Society. Some Iris bloom from February through to September, but the optimal time for Iris is May into June. The stone wall adjacent to the Cary Castle Mews is the ideal habitat for rare and sensitive lewisia species. The lewisia is planted in the tradition of the Lewisia Wall of the Royal Horticultural Society in England. Pearkes Peak is named in honour of former Lieutenant Governor George Pearkes, who enjoyed donning his Wellington boots to clear and plant the area. Pearkes Peak is located south of the duck pond and is one of the largest gardens on the property, consisting of three rocky areas separated by grass and paths. The vegetation consists of several Garry Oaks, ornamental shrubs, native plants, and bulbs. This natural rock outcropping adjacent to the Trades driveway is planted with ferns and native plants including pink and white Erythronium species. The Rock and Alpine Garden lies on the south-west corner of Government House, on the outcropping of rock below the swimming pool. This garden features choice plants from the mountainous areas of the world. Most of the plants in this garden were started from seed and obtained from the Alpine Garden Society, London; The Scottish Rock Garden Club, Edinburgh; and the Alpine Garden Club of BC, Vancouver. Rockland Border I parallels Rockland Avenue from the duck pond to the exit gate. This south-facing location offers one of the most spectacular borders in British Columbia. Plants include tropicals, such as ginger and Birds of paradise, as well as ornamental grasses and flowering bulbs, creating colour and texture throughout the year. Rockland Border I is most sensational during the summer when the perennials are in full bloom. Rockland Border II is located between the exit gate and the Trades gate and is shaded by magnificent trees. It is planted with a selection of hydrangea species, including the rare hydrangea sargentiana, Physocarpus opulifolius “Diabolo” and Fatsia japonica. Herbaceous perennials include a selection of hosta species, heuchera species, cultivars and ornamental grasses. The Rotary Garden of International Friendship was the inspiration of Rotarian Alan Potter. Funds for the garden were contributed by Rotary clubs worldwide to finance a collection of trees and shrubs to represent the countries and regions of the world. The Harbourside Rotary Club of Victoria sponsored the project and summer flowering shrubs, herbaceous perennials and bulbs were planted and developed by a team from the Friends of Government House Gardens Society and Rotarians. The Sunken Rose Garden lies on the western side of the property, south of the English Country Garden. The garden is designed around a tiered fountain and is planted with a wide variety of scented roses, representing most of the major classes of modern and old roses. Many were gifts from British rose breeder David Austin and local nurseryman Robin Denning. The Sunken Rose Garden is in bloom June through October. Located in a high position behind Government House, the Terrace Gardens offer a spectacular view over the Woodlands, the Salish Sea and the Olympic Mountains. The Terrace Gardens feature an array of drought and wind tolerant plants. These include euphorbia species from Africa, grevillea species from Australia, hebe and leptospermum species from New Zealand, California ceanothusspecies and Romneya coulteri. Mediterranean plants are well represented including Cistus, Genista, Phlomis, Salvia and Thymus species. Plants with silver-grey foliage are a specific feature. The formal design of the Victorian Rose Garden is based on the plan for the Rose Garden at Warwick Castle in England, created by renowned 19th century gardener Robert Marnock. Boxwood-edged beds are planted with pink and white roses. Four benches at the main entrance of the Victorian Rose Garden commemorate former Lieutenant Governor David Lam and Mrs. Dorothy Lam, the Province of British Columbia and the British Columbia Buildings Corporation, who jointly financed the garden. The Winter Garden is located on the west side of the Trades driveway, between the Victorian Rose Garden and the Rotary Garden of International Friendship. The winter and early spring flowering plants are in bloom from November to March. There is a splendid rare Chinese shrub Stachyurus praecox, numerous Hamamelis (Witch–Hazel) shrubs, Lonicera fragrantissima and Cornus mas. Primulas and flowering bulbs carpet the ground below the shrubs. The Woodlands are a unique example of a Garry oak ecosystem in an urban setting. Along with Garry oaks, the 8.9 hectare (22 acre) Woodlands feature a tapestry of wildflowers, Camas, western buttercup and white fawn lilies. The aim of the Friends is to protect, preserve and restore this Garry oak habitat while providing the public with opportunities for appreciation and education. There is open access to the Woodlands with a public pathway providing visitors a view of this native British Columbia area.